Spending at merchants on credit, debit, and prepaid cards rose 7.0% in 2016, generated $5.648 trillion in purchases. “Consumers are choosing credit cards over debit cards to gain rewards from banks and other issuers." Credit, debit, and prepaid cards issued in the U.S. generated $5.648 trillion in purchase volume in 2016, up 7.0% over 2015, according to The Nilson Report, the leading card and mobile payment trade publication. American Express, Discover, Mastercard, and Visa credit cards topped $3 trillion for the first time, generating a combined $3.059 trillion in spending at merchants, up 8.0% over 2015. Debit and prepaid cards with those brands as well as the brands of EFT networks Star, Pulse, Nyce, Interlink, Accel, and others combined to generate $2.589 trillion in purchase volume, up 5.8%. Credit cards increased their market share of purchase volume over debit and prepaid cards to 53.64%, up from 45.84% in 2015. It was the fifth year in a row in which credit cards gained market share. “Consumers are choosing credit cards over debit cards to gain rewards from banks and other issuers,” said David Robertson, Publisher of The Nilson Report. JPMorgan Chase, the largest issuer of consumer and commercial credit, debit (including EFT network), and prepaid cards since 2008, generated $861.30 billion in purchase volume, remaining the top issuer. American Express remained the largest issuer based on combined credit card purchase volume. Wells Fargo overtook Bank of America to become the largest issuer based on debit and prepaid purchase volume. Wells Fargo remained the largest issuer based on signature debit purchase volume, and overtook Bank of America to become the largest based on PIN debit purchase volume. The Bancorp Bank remained the largest prepaid card issuer. Now in its 46th year of publication, The Nilson Report is the most respected source of news and analysis of the global card and mobile payment industries. It does not accept paid advertising of any kind. It carries no advertisements, no articles written by vendors, and no sponsored content. The by-subscription-only newsletter provides statistics on issuers and acquirers of credit, debit, and prepaid cards not found in any other trade journal. It also presents concise news and updates on technology, personnel, and products. 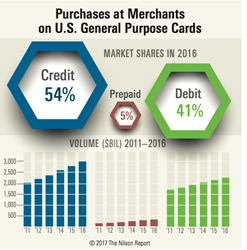 The full report on U.S. Card Spending at Merchants, which appears in the current issue of The Nilson Report, is available by contacting us at info(at)nilsonreport(dot)com and requesting Issue 1108.